If we kept the tax rate at $1.205, it is not an increase in the tax rate — that is correct — but it is a tax increase. That’s why we go through the process to find out what equalization is, and equalization of what today’s $1.205 is, is at $1.155. That is the value of the revenue that we would raise under last year’s property values. 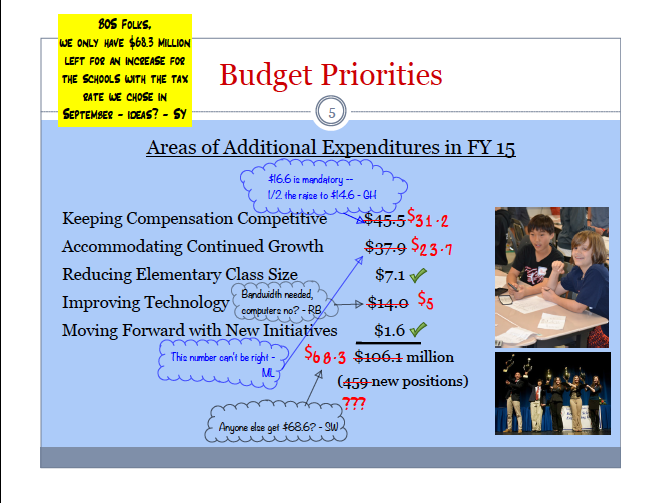 The difficulty that the Board does have and faces every year is the impact of its decision on the budget. At $1.155, which I’ll just now represent as equalization, for many people can be a tax burden decrease. For many people, at equalization, they’re out of the box at $500+ an increase in tax burden, because unfortunately some folks assessments have gone up anywhere above 8%, and I’ve heard as high as 18%. So we have to keep in mind, not only to ensure that we fund the services in Loudoun County, but that we also try to ensure an affordable community for folks to live in and it is a delicate balancing act. So, just note, again, that $1.205, if we left it there, it is a tax increase. That’s just fact. This is another great example of a member of the Board of Supervisors complaining about people getting their facts wrong, when it's really a matter of perspective. Taxing a value at the same rate is not a tax increase due to the value being increased. If your income tax rate is 28% and you get a raise, the federal government did not raise your taxes, even though you'll pay more on your income tax bill. Likewise, the county is not increasing your taxes if they keep the tax rate flat and your property value increases. Yes, your property tax bill will increase, but the county did not raise your taxes. As you can see in the above chart, taken from the proposed county budget plan, this Board has lowered both the tax rate and the average tax bill for the past three years. If the Board were to maintain the current tax rate, the average taxpayer would pay less than they paid in FY09, FY11, and FY12. If you want to see the affect of raising the tax rate one cent on your tax bill, try out this tax calculator. Many people also do not consider it "unfortunate" that their property values have increased. Instead, they appreciate the housing recovery and its affect on the equity in their home. You can sign up to speak at the public input at the regular Board of Supervisors meeting being held today, March 5, at the Loudoun Government Center in Leesburg by calling (703) 777-0200 by noon today or signing up when you get there. Public input starts at 6pm. 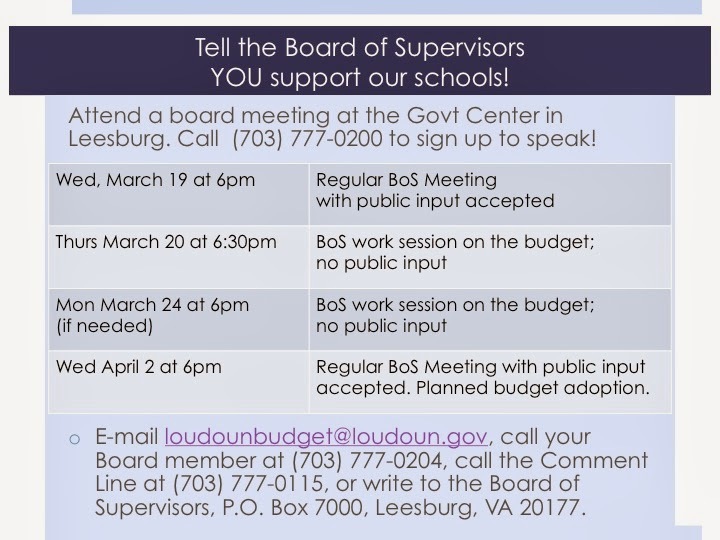 Remember to email your supervisors at loudounbudget@loudoun.gov as well. To view Mr. York's comments yourself, see go to the 2:01:15 mark of the video online. It's not over. So, what's next? The Board of Supervisors was scheduled to meet with the School Board for a work session on their budget request on Monday, March 3, but due to the weather, it was changed to Saturday, March 8 at 9am. It will still be at the Government Center in Leesburg. You can watch in person or on Comcast Channel 23, Open Band Channel 40, Verizon FiOS Channel 40, or online at the Loudoun County Webcast System. There may be straw votes taken at this meeting. It's a bit concerning that it's now a Saturday session as Mr. Reid will likely not attend due to religious reasons. Supervisor Reid (Leesburg) has been signaling his support for schools and being open to paying for it at a tax rate closer to the current one. If you didn't get a chance to speak at one of the public hearings, you can still let the Board of Supervisors know you support our schools at the public input at 6pm on Wednesday, March 5 at the regular Board of Supervisors meeting. To speak, call (703) 777-0200 by noon on Tuesday to sign up in advance or just sign up in person at the meeting. There are more work sessions scheduled mostly on Mondays and Thursdays through March 24, but no others specified for the school budget alone at this point. You'll be able to speak in person to the Board at least one more time after the school work session on Wednesday, March 19 at their regular meeting. 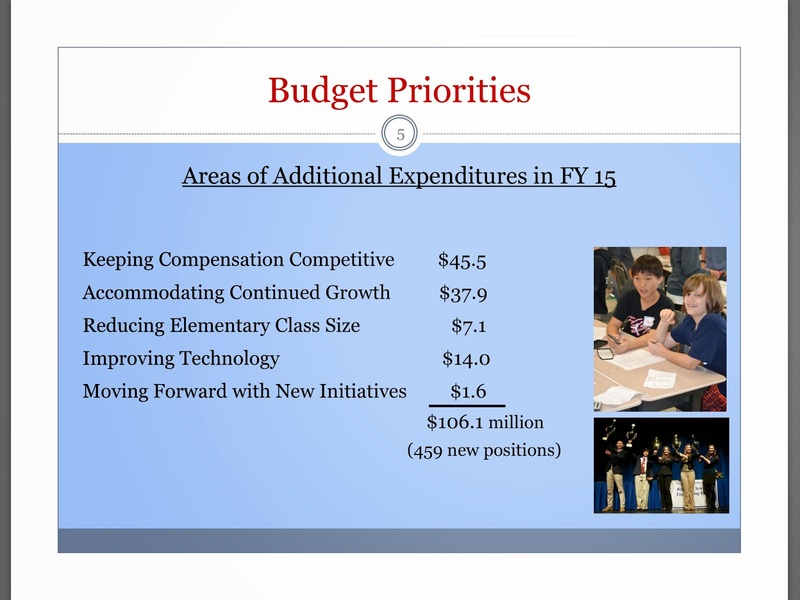 Final budget adoption is expected at the regular meeting Wednesday, April 2. Last year, the vote was taken before the public input part of the meeting. Keep monitoring here and local news sources for pertinent information. If you haven't yet, send an email to loudounbudget@loudoun.gov (or even if you have, but have a new thought!). You can also contact your supervisors directly (everyone has two: your district's and Chairman York) by email or call (703) 777-0204. You can also write a letter to Board of Supervisors, P.O. Box 7000, Leesburg, VA 20177. And once the Board of Supervisors finalizes their budget, if there are any cuts, that will go back to the School Board to reconcile any differences. But we'll get to that later!